The LVT of World War 2 fame had its origin in a tracked civilian design, known as the “Alligator”, devised by American engineer Donald Roebling. He specifically designed it as a rescue vehicle, to be utilized in the vast Florida swampy areas (like the Everglades). Its robust tracked nature and boat-like qualities made it ideal for this purpose. The concept dated back as far as 1933. Seeing the value of such a machine, the United States Marine Corps talked to Roebling about modifying his design for military use in 1940. As the Marine Corps, who were trained to fight on land, had to be deployed from their ships, and the biggest threat to America being the Empire of Japan in the Pacific, were island-hopping was soon to be the norm, it seemed like a good fit. By May 1940, the first prototype was ready, with a Mercury 94K engine. As more funds became available, a second one, propelled by a Lincoln-Zephyr powerplant, saw its first trials later in the summer of that year. It was ultimately accepted for service and production was set up. D. Roebling named the prototype “Alligator”. The LVT-1 sported a top speed of 12 miles per hour (19 km/h). The armament comprised either 2 x 0.30 (7.62 mm) caliber general purpose machine guns or 2 x 0.50 (12.7 mm) caliber heavy machine guns mounted on rails or pintle mounts, with optional limited shielding. Troop capacity was 18 to 24 combat ready soldiers. The powerplant was adapted from a single Hercules WXLC-3 engine (146 hp). The main identification point for the LVT-1 is that its cab is placed right at the bow of the vehicle. Early versions of the LVT-1 had the 3 driver’s cab windows spaced farther apart than later versions. The tracks of the LVT had large grousers attached, which propelled the vehicle through the water, and gave a solid grip on soft terrains, which was aided by its low ground pressure: 0.6 kg/cm2. However, the speed was slow and the nature of both the suspensions and tracks forbade any use on hard grounds. The transmission comprised the main clutch, a five-speed gearbox, dual differential and final drives. The suspension counted 11 rollers, with the first and last rollers slightly raised as tenders and for better grip on sloped grounds. There were rear guide wheels on each side. Hollow side pontoons with internal partitions helped buoyancy. Since the LVT-1 was unarmored, it was most useful as a ship-to-shore cargo ferry, and it could haul 4500 lbs (2000 kg) at a time (later 18 fully-equipped marines or 2000 kg of cargo). The crew consisted of the driver, the commander and the assistant driver, while the marines manned the on-board weapons. Production by Food Machinery Corporation began in 1941, with the first 200 contracted vehicles. After early combat experience, four machine-guns – two of each type – were being fitted forward and aft of the loading area, for maximum support defense. Some 1,225 of the LVT-1 series were ultimately produced, until late 1942. It is of note that the LVT-1 series models were not armored in any way, and were generally intended as 2nd line resupply vehicles. However, crews later modified the vehicles with additional welded-on 9 mm (0.35 mm) appliqué armor just below the cabin windows, on the frontal sloped glacis, then the most obvious target. The cal.50 (12.7 mm) mounts were also reinforced to allow simple armored masks to be fitted, and additional cal.30s (7.62 mm) were added. In this configuration, they shifted from a supply duty to a first line assault one, first engaged in this manner at Tarawa. The LVT-1 was first engaged with the USMC 1st Division, in resupply operations at Guadalcanal during the fall 1942-early 43, until the full conquest of the island. These were later engaged in most early “island hopping” operations of 1944. Their most important engagement as assault amphibious vehicles came at Tarawa. More than 260 were committed into action, in the first, second and third waves of landings, and pursued the continuous supply of ammunition, reinforcements, and ferrying back the injured. By the end of 1943, some 200 were sent to the British army for training, in preparation for future operations in France and the Netherlands. It was observed that these vehicles experienced many breakdowns, and were gradually phased out before 1945. 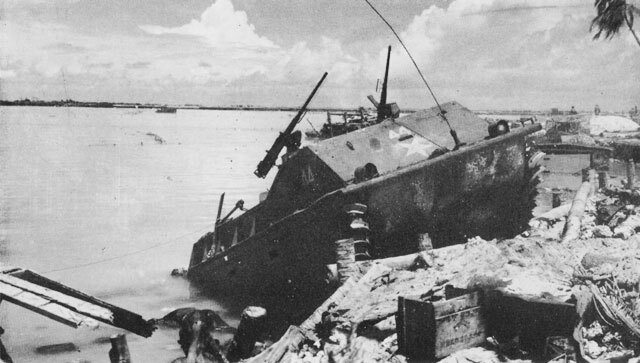 LVT-1 at Guadalcanal, fall 1942, 2nd Battalion of amphibious tractors, 1st USMC Division. LVT-1 “My Deloris” of the USMC at Tarawa, 1943. LVT-1 of the USMC, 708th Amphibian Tank Battalion, Saipan, 15 June 1944.